Themes of racial politics, female empowerment and mortality feature heavily in music critics' favourite albums of 2016. 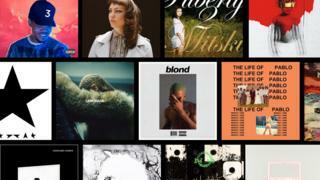 The BBC looked at 25 of the "best of 2016" lists in music's most influential publications - including the NME, Rolling Stone, Vice, Billboard and Q Magazine - to discover the highest-ranked albums of the year. As a teenager, you're often told the torrent of emotional ups and downs is "just hormones" and once puberty ends, life will sort itself out. But what if that's not true? On her fourth album, 26-year-old indie-pop artist Mitski Miyawaki confronts that head on - exploring her anxiety, depression, happiness and everything in between. The songs mirror her turmoil, veering from the hushed sincerity of Once More To See You to the squalling punk of My Body's Made of Crushed Little Stars. A darling of America's lo-fi folk-rock scene, Missouri-born Angel Olsen got playful on her fourth album. Inspired by David Bowie, she experimented with different styles, new singing voices and, in the video for Intern, a bright silver tinsel wig. The record is divided into two halves - an upbeat, pop-infused "side A", followed by a more introspective B-side, hinged around the cathartic, seven-minute fuzz-rock ballad Woman, in which she sings: "I dare you to understand/What makes me a woman." Radiohead rekindled their relationship with melody on their ninth album, the beautiful and serene A Moon Shaped Pool. Thom Yorke's break-up from his long-term partner Rachel Owen (who sadly died this week) pervades the album, adding a layer of melancholy to many of the songs - not least the closing track, True Love Waits, written at the start of their relationship in 1995 but uncompleted until this year. Recorded in secret before rapper Phife Dawg's death from diabetes in March, A Tribe Called Quest's first album in 18 years was an unexpected return to form. Lead single We The People addresses the rise in right-wing supremacism ("Muslims and gays?/Boy, we hate your ways," raps Q-Tip sardonically), while the Musical Youth-sampling Dis Generation is a salute to the rappers inspired by the Tribe's brand of socially-conscious hip-hop. Hyperactive, ambitious and never truly finished, The Life Of Pablo gave an unprecedented glimpse into Kanye West's creative process - not to mention the psyche of the "38-year-old eight year old". Initially available as a streaming exclusive on Tidal, it was tweaked and updated several times, and while much of it remains infuriatingly unfocused, West's lack of respect for musical boundaries makes for a compelling listen. A year ago, Solange Knowles published an essay detailing the prejudice and hostility she has encountered in schools, airports and concert venues, simply for being a black woman. It prompted a year of musical soul searching, in which she moved to Louisiana (where her grandparents lived until a Molotov cocktail was thrown into their home) and recorded a graceful, restrained album that addresses segregation, reverse racism, police brutality, cultural theft and black pride. Inspired by the birth of his son and brimming with gospel influences, Chance The Rapper's third album effortlessly shakes off the self-obsessed nihilism of modern hip-hop for something altogether more joyful. Lyrically sharp and fiercely independent, the Chicago-born musician shunned major label deals to release the album as a streaming exclusive on Apple Music. It duly became the first record to top the US charts without ever being sold. With all the punctuality of Southern Trains, Frank Ocean's second album arrived four years late, one morning in August. It was worth the wait. Hazy and meandering, its 17 tracks glide in and out of focus like a fever dream, as Ocean ponders on love, loss and reality itself. Difficult to digest at first, it rewards the repeat listener with richly-detailed sonic secrets. David Bowie's death in January was all the more shocking because he sounded so creatively invigorated on Blackstar. Retrospectively recognised as his "parting gift", it finds the star coming to terms with his own mortality (the title itself implies a light flickering out) while the music, recorded with a New York jazz band, suggests a journey into the unknown. From the moment she performed at the Super Bowl dressed in Black Panther gear, it was clear Beyonce had something to get off her chest. Two months later, she let us have it - a fierce, densely-layered album that uses Jay Z's (alleged) infidelity as the framing device for a meditation on black history, female identity, betrayal, resilience and redemption. Sumptuously produced, the record also sees Beyonce spread her musical wings: she flaunts her Texas roots on the country ballad Daddy Lessons; while the Jack White-assisted Don't Hurt Yourself has been nominated for best rock performance at next year's Grammys. But more than that, Lemonade is a window into the soul of a performer who has often seemed remote and untouchable. On Sandcastles, as she furiously scratches Jay Z's face off a photograph, her flawless vocals suddenly falter and fall apart. But, this being Beyonce, the album ends with reconciliation: "With every tear came redemption and my torturer became my remedy," she says in a spoken-word interlude. "So we're gonna heal, we're gonna start again." By association, she's telling marginalised women everywhere they can reclaim their lives through strength and forgiveness. And being a badass. The 25 "best of lists surveyed appeared in: The Atlantic, The AV Club, Billboard magazine, Consequence of Sound, Cosmopolitan, Digital Spy, Entertainment Weekly, The Guardian, The i Newspaper, Mojo, NME, NPR, Paste, Pitchfork, Q Magazine, Rolling Stone, Salon, Spin, Stereogum, The Times, Time Magazine, Time Out London, Time Out New York, Uncut and Vice.